Dining is available at one of the resort's 3 restaurants and guests can grab coffee at the coffee shop/café. Public areas are equipped with complimentary wireless Internet access. 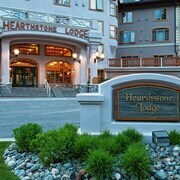 Hearthstone Lodge by Bear Country features ski-in/ski-out access and a fitness center. 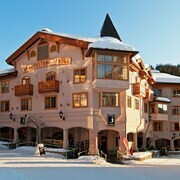 This ski resort also offers multilingual staff, ski storage, and a fireplace in the lobby. Parking is available onsite for a surcharge. Hearthstone Lodge by Bear Country is a smoke-free property. Located in the mountains, this ski-in/ski-out resort in Sun Peaks is within a 5-minute walk of Sun Peaks Golf Course and Sun Peaks Resort and close to winter sports such as cross-country skiing and skiing lessons. Memorial Park is 26.8 mi (43.1 km) away. Ski into Hearthstone Lodge by Bear Country, where you can cozy up to a roaring lobby fireplace after an exciting day on the slopes. All 70 rooms boast fireplaces and offer free WiFi and kitchenettes. Sofa beds and DVD players are standard, as are LCD TVs with digital channels. 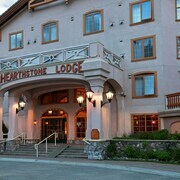 Hearthstone Lodge by Bear Country offers 70 accommodations with fireplaces and DVD players. Accommodations are furnished with double sofa beds. 32-inch LCD televisions come with digital channels. Accommodations at this 3-star resort have kitchenettes with full-sized refrigerators/freezers, stovetops, microwaves, and cookware/dishes/utensils. Bathrooms include shower/tub combinations, complimentary toiletries, and hair dryers. Guests can surf the web using the complimentary wireless Internet access. Business-friendly amenities include phones along with free local calls (restrictions may apply). Additionally, rooms include coffee/tea makers and irons/ironing boards. Housekeeping is provided daily. Bella Italia - This restaurant specializes in Italian cuisine and serves dinner only. Guests can enjoy drinks at the bar. Reservations are required. Mountain High Pizza - This restaurant specializes in Italian cuisine and serves lunch and dinner. Oya - This sushi bar specializes in Asian cuisine and serves dinner only. Guests can enjoy drinks at the bar. Todd Mountain Cafe - This café specializes in American cuisine and serves breakfast, brunch, and lunch.